Preston has gone hiking, biking, skiing, swimming, kayaking and canoeing with Mommy and Daddy and enjoys them all. Mommy and Daddy always hoped beside sports, Preston could also be involved in some more cultured activities with them. It seems like they’ve moved to the right city! 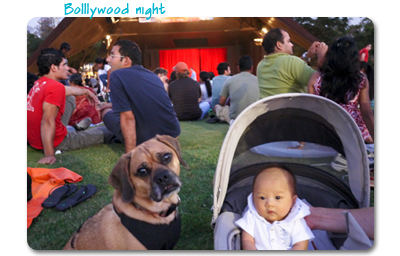 Houston’s Miller Outdoor Theater is an excellent performing arts theater that provides diverse performances from March through October. They are free and DOG FRIENDLY! Throughout the summer, Mommy and Daddy have enjoyed several great performances with Preston. They like to pack their dinner (and Preston’s of course!) and have a picnic on the hillside before the show starts. Preston has always been a very well behaved audience and patiently sat through the 3-hour performance. Nolan joined the family activity for the first time. He was very well-behaved too!